A survey of one-relator products of cyclics or groups with a single defining relation, extending the algebraic study of Fuchsian groups to the more general context of one-relator products and related group theoretical considerations. It provides a self-contained account of certain natural generalizations of discrete groups. 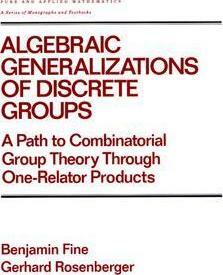 Introduction and historical remarks; preliminaries from combinatorial group theory; one-relator groups; discrete groups; one-relator products; one-relator products of cyclics; linear properties of one-relator products of cyclics; groups of F-type; related generalizations of discrete groups.